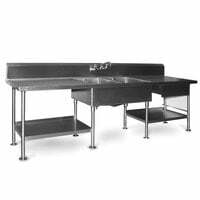 We offer stainless steel work tables with sinks that solve two common kitchen problems by providing much-needed prep space as well as access to running water. 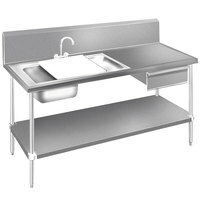 Having a convenient kitchen sink table allows you to wash your produce then start prepping it right away without moving it to a new location. 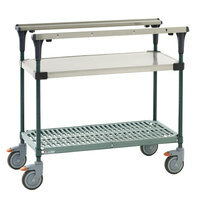 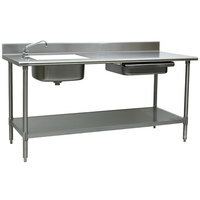 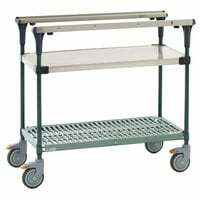 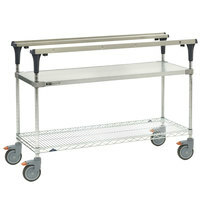 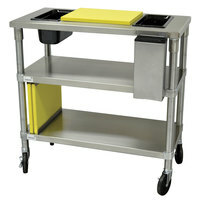 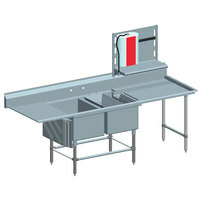 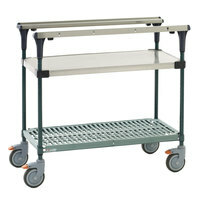 A stainless steel prep table with sink helps your kitchen staff to perform their prep work safely and efficiently. 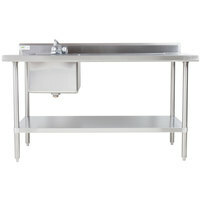 Also make sure to check out other great items from Regency Tables & Sinks, Advance Tabco, Metro and Eagle Group. 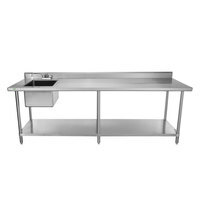 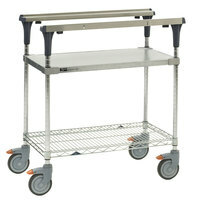 Advance Tabco DL-30-72 Stainless Steel Prep Table with Sinks, Drawer, Cutting Board and Undershelf - 72"
Advance Tabco DL-30-96 Stainless Steel Prep Table with Sinks, Drawer, Cutting Board and Undershelf - 96"
Metro MS1830-FGFG PrepMate MultiStation with Galvanized Shelving - 32" x 19 3/8" x 39 1/8"
plusMetro MS1824-FGFG PrepMate MultiStation with Galvanized Shelving - 26" x 19 3/8" x 39 1/8"
plusMetro MS1824-FGBR PrepMate MultiStation with Galvanized and Brite Zinc Wire Shelving - 26" x 19 3/8" x 39 1/8"
plusMetro MS1824-FSFS PrepMate MultiStation with Stainless Steel Shelving - 26" x 19 3/8" x 39 1/8"
plusMetro MS1824-FSNK PrepMate MultiStation with Stainless Steel and MetroSeal 3 Wire Shelving - 26" x 19 3/8" x 39 1/8"
plusMetro MS1824-NKNK PrepMate MultiStation with MetroSeal 3 Wire Shelving - 26" x 19 3/8" x 39 1/8"
Metro MS1830-FGBR PrepMate MultiStation with Galvanized and Brite Zinc Wire Shelving - 32" x 19 3/8" x 39 1/8"
Metro MS1830-FSFS PrepMate MultiStation with Stainless Steel Shelving - 32" x 19 3/8" x 39 1/8"
Metro MS1830-FSNK PrepMate MultiStation with Stainless Steel and MetroSeal 3 Wire Shelving - 32" x 19 3/8" x 39 1/8"
Metro MS1830-NKNK PrepMate MultiStation with MetroSeal 3 Wire Shelving - 32" x 19 3/8" x 39 1/8"
Metro MS1836-FGBR PrepMate MultiStation with Galvanized and Brite Zinc Wire Shelving - 38" x 19 3/8" x 39 1/8"
Metro MS1836-FGFG PrepMate MultiStation with Galvanized Shelving - 38" x 19 3/8" x 39 1/8"
Metro MS1836-FSFS PrepMate MultiStation with Stainless Steel Shelving - 38" x 19 3/8" x 39 1/8"
Metro MS1836-FSNK PrepMate MultiStation with Stainless Steel and MetroSeal 3 Wire Shelving - 38" x 19 3/8" x 39 1/8"
Metro MS1836-NKNK PrepMate MultiStation with MetroSeal 3 Wire Shelving - 38" x 19 3/8" x 39 1/8"
Metro MS1836-PRPR PrepMate MultiStation with SuperErecta Pro Shelving - 38" x 19 3/8" x 39 1/8"
Metro MS1848-FGBR PrepMate MultiStation with Galvanized and Brite Zinc Wire Shelving - 50" x 19 3/8" x 39 1/8"
Metro MS1848-FGFG PrepMate MultiStation with Galvanized Shelving - 50" x 19 3/8" x 39 1/8"
Metro MS1848-FSFS PrepMate MultiStation with Stainless Steel Shelving - 50" x 19 3/8" x 39 1/8"
Metro MS1848-FSNK PrepMate MultiStation with Stainless Steel and MetroSeal 3 Wire Shelving - 50" x 19 3/8" x 39 1/8"
Metro MS1848-NKNK PrepMate MultiStation with MetroSeal 3 Wire Shelving - 50" x 19 3/8" x 39 1/8"
plusMetro MS1824-FSPR PrepMate MultiStation with Stainless Steel and SuperErecta Pro Shelving - 26" x 19 3/8" x 39 1/8"
plusMetro MS1824-PRPR PrepMate MultiStation with SuperErecta Pro Shelving - 26" x 19 3/8" x 39 1/8"
Metro MS1830-FSPR PrepMate MultiStation with Stainless Steel and SuperErecta Pro Shelving - 32" x 19 3/8" x 39 1/8"
Metro MS1830-PRPR PrepMate MultiStation with SuperErecta Pro Shelving - 32" x 19 3/8" x 39 1/8"
Metro MS1836-FSPR PrepMate MultiStation with Stainless Steel and SuperErecta Pro Shelving - 38" x 19 3/8" x 39 1/8"
Metro MS1848-FSPR PrepMate MultiStation with Stainless Steel and SuperErecta Pro Shelving - 50" x 19 3/8" x 39 1/8"
Metro MS1848-PRPR PrepMate MultiStation with SuperErecta Pro Shelving - 50" x 19 3/8" x 39 1/8"
Eagle Group SMPT30144 Stainless Steel Prep Table with Sink, Drawer, Cutting Board, and Undershelf - 144"
Eagle Group PT 3072 Stainless Steel Prep Table with Sink, Drawer, Cutting Board, and Undershelf - 72"
Eagle Group PT 3084 Stainless Steel Prep Table with Sink, Drawer, Cutting Board, and Undershelf - 84"
Eagle Group PT 3096 Stainless Steel Prep Table with Sink, Drawer, Cutting Board, and Undershelf - 96"
Eagle Group SMPT30108 Stainless Steel Prep Table with Sink, Drawer, Cutting Board, and Undershelf - 108"
Eagle Group SMPT30120 Stainless Steel Prep Table with Sink, Drawer, Cutting Board, and Undershelf - 120"
Eagle Group SMPT3096 Stainless Steel Prep Table with Sink, Drawer, Cutting Board, and Undershelf - 96"
With work table preparation stations, your employees have plenty of room to create sauces, marinade meats, and slice vegetables for your signature dishes. 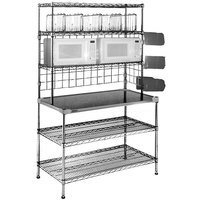 Most of these stations come with storage shelves, so your staff can easily grab the tools and equipment they need for their prep work. 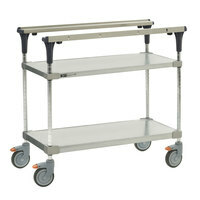 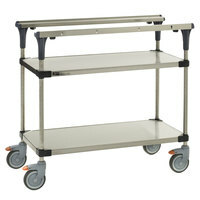 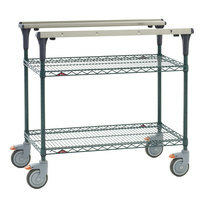 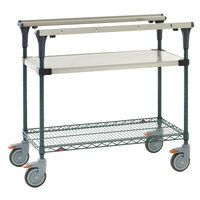 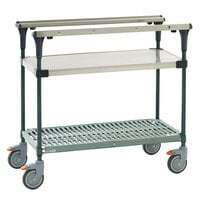 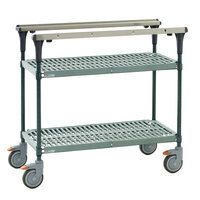 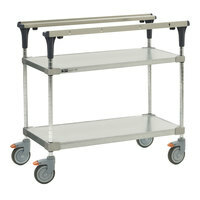 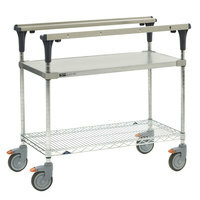 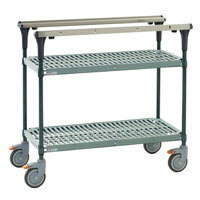 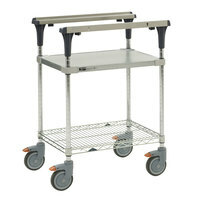 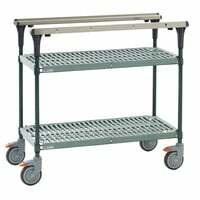 These products also have a steel top that provides a durable staging and work area. 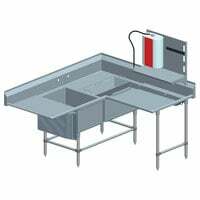 Best of all, some of our preparation stations are NSF Listed, ensuring you receive a product that is easy to keep clean. 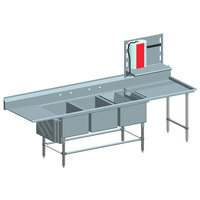 For more restaurant equipment, check out our underbar ice bins, wall-mount pre-rinse faucets, and cold tables. 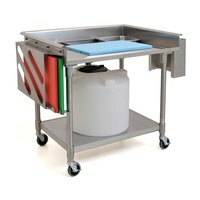 If you're wondering where to buy work table preparation stations, we have a large selection of work table preparation stations for sale at the lowest prices.